This exhibit displays a complete body of work by one of the 20th century’s most significant artists. 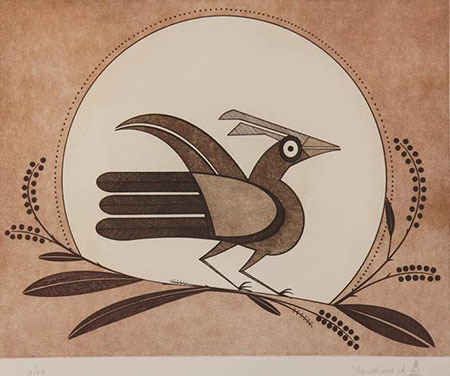 Spirit Lines: Helen Hardin Etchings features all 23 first editions of the Santa Clara Pueblo artist’s collection of copper plate etchings completed by the artist from 1980 to 1984. This is the first time this body of work has been assembled and shown in its entirety. 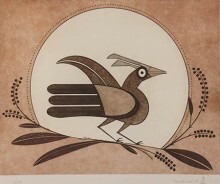 Helen Hardin (1943 – 1984) was the daughter of artist Pablita Velarde (1918 – 2006) from the Santa Clara Pueblo near Albuquerque, New Mexico. Shortly after birth Hardin was given the name Tsa-Sah-Wee-Eh, meaning Little Standing Spruce, in the Tewa language. As Helen’s father was Anglo, she was unable to participate in Pueblo ceremonies. Unlike her mother, who painted scenes of traditional Pueblo life, Hardin chose to interpret images of ancient pottery and rock art designs into contemporary, abstracted, highly individualized compositions. 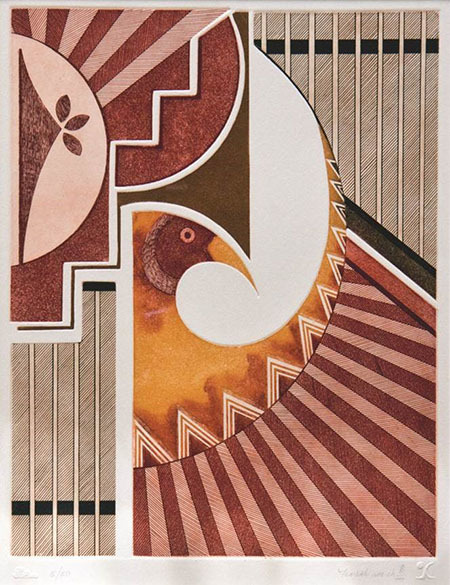 With the use of repeated geometric forms and layering techniques, viewers obtain a sense of introspect into a woman artist whose work is divided between traditional and modern worlds. Through her groundbreaking career, Hardin created avenues for other Native women to break from traditionalism. Starting at a young age, Hardin won many awards and exhibited her work at various galleries and markets including the Gallup Inter-Tribal Ceremonials, New Mexico State Fair Indian Village, Santa Fe Indian Market, Western Artists Show in New Jersey and solo shows including one in Bogota, Colombia in 1968. In 1970 she was featured on the cover of New Mexico Magazine and in a segment on American Indian artists produced by Public Broadcasting Service in 1976. Until her death in 1984 at age 41, Hardin continued to produce and sell her work across the nation as well as her home state of New Mexico. Her work can be found in private and museum collections across the nation. This exhibition illustrates the variety of techniques used in the copper plate etching process. Etching, practiced by artists since the early 15th century, has evolved to the present day as an important form of artistic expression. The exact processes and precise techniques of copper plate etching were fitting for the labor-intensive, detailed compositions created by Helen Hardin. The exhibit is on display through Oct. 31, 2016, in the hall of the Marguerite S. Roll Research Wing, with access from the Berlin Mezzanine Gallery. Spirit Lines: Helen Hardin Etchings is on loan from Helen Hardin #1’s LLC – a Nevada Corporation.